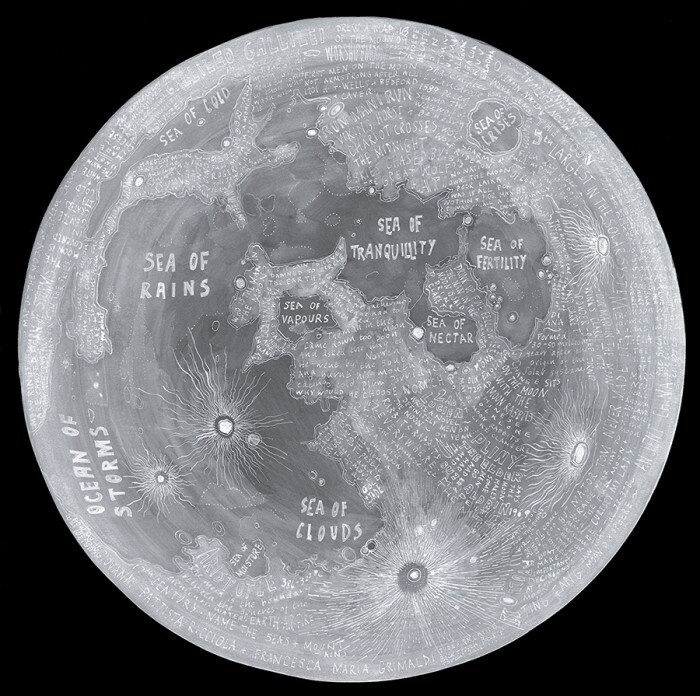 An annotated map of the moon documenting layers of lunar knowledge from the earliest drawings in caves to Gallileo’s telescope to traditional folklore and the moon landings. I am interested in how maps can explore layers of history and knowledge; a cultural geography and not just a physical geography. This map is drawn in white ink on slate coloured board and is framed in black wood, float mounted on black with a further circular window mount. Unframed giclee prints 40×40 cms £65.00 here. Limited edition print (of 50) 70x70cms £200.00 available from Art Republic.